It is November 1st. 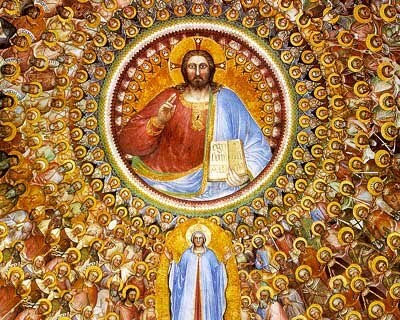 Today is the Solemnity of All the Saints. On this day we remember and honor all the Saints who have fought the good fight and won in Jesus' name. There are so many Saints we can read about and whose lives of virtue we can imitate in order to achieve Christian perfection. This celebration has taken place in the Church since the 4th century. However it was not a universal feast until Pope Gregory IV had it established as such and moved it to November 1st. We all are called to be Saints. In a world that is full of moral confusion, evil, despair and depression, we can look to the Saints who faced similar things but never gave up or gave in to temptation. We can pray to them and ask for their intercession before Our Lord. Praying to Saints does not mean that we worship them or give them the same status as Jesus who is the Sole Mediator to God the Father. Rather, we offer dulia, or a special respect and honor that is given to those who are Saints. Only God gets latria or worship, no one else. I invite you to read about the Saints and chose one or several who you can relate to. Try to apply their example into your life and ask them to help you become more Christ-like. The Saints are our friends - our brothers and sisters in God's family. May all the Saints in heaven pray for us here on Earth and the souls in Purgatory. From all evil, O Lord deliver us. In the day of judgment, O Lord deliver us. Almighty, everlasting God, who hast dominion over both the living and the dead and art merciful to all who, as Thou foreknowest, will be Thine by faith and works; we humbly beseech Thee that they for whom we intend to pour forth our prayers, whether this present world still doth detain them in the flesh or the world to come hath already received them stripped of their mortal bodies, may, by the grace of Thy fatherly love and through the intercession of all the saints, obtain the remission of all their sins. Through our Lord Jesus Christ, Thy Son, who with Thee in the unity of the Holy Spirit liveth and reigneth God, world without end. Amen.